As prescription painkiller overuse has led to what many have termed the "worst drug crisis in American history," it is our nation's heroes—our veterans—who are at the forefront of this opioid epidemic. According to VA officials, approximately 60% of veterans returning from the Middle East and 50% of aging veterans experience chronic pain. As opioid use for pain has risen to an all-time high (prescriptions for opioids spiked by 270% over 12 years, according to a 2013 analysis by the Center for Investigative Reporting), it has become obvious that change is needed. Veterans have been at a higher risk for addiction and fatal overdose because of this issue. In late 2013, the Opioid Safety Initiative (OSI) was rolled out with new guidelines for prescribing. Key findings from a recent study shows that this effort is working—but more change is still needed. According to the study, which was published in the journal Pain, the efforts made through OSI appear to be achieving the intended goal of safer prescribing. Over a two-year period, high-dose opioid prescribing declined by 16% and very high-dose prescribing by 24%. The number of patients receiving both opioids and benzodiazepines—which can be lethal when combined—dropped by 21%. The OSI is based on an approach called "audit and feedback," which has been used successfully in other efforts to improve health care quality and safety. The study looking at OSI's effectiveness was conducted by researchers from the University of Michigan Medical School along with the University of Michigan Institute for Healthcare Policy and Innovation, the VA Ann Arbor Healthcare System, and Yale University. It began with research on VA opioid prescribing the year before the OSI was rolled out. Then the researchers examined OSI during its first year to determine its impact. The team has called the findings "encouraging" but say there is still a way to go to make prescribing even safer. It is their hope that other hospitals and health networks will employ similar tactics as the VA in order to review their prescribing and possibly make changes. Lewei Allison Lin, MD, first author on the study and an addiction fellow in the University of Michigan department of psychiatry who trained in the VA system, says that as a whole the nation is still learning about how to reduce risky opioid prescribing, and there is still room for change. Further efforts to continue to reduce risky opioid prescribing will need to continue to take patients' pain, mental health, and possible addiction care needs into account, along with physicians' decision-making. All of these facets make it a complex issue but one that should not be ignored. It was a shared electronic health record (EHR) system across all of the VA locations that made the "audit and feedback" approach work. The implementation of a "dashboard" tool through the VA's national computerized medical record system has allowed clinical leaders to review opioid prescribing and give physicians their feedback. Lin says that the VA's EHR system has been key to being able to broadly implement an initiative such as OSI. "The shared EHR system across all VAs is a huge strength and really allows these types of initiatives to be implemented and to be assessed," Lin explains. "The dashboard tool aggregates the EHR data and is able to give different facilities a sense of how they are doing on important measures such as percentage of patients receiving higher doses and coprescribing benzodiazepines." However, Lin says there is more to the success of safer prescribing than the use of an EHR system. She says that getting people on board is ultimately just as critical. Hospitals must embrace guidelines in order for them to have an impact. "I would say that having a clinical champion, and in general having systemwide interest in promoting safer prescribing is perhaps just as key to success [as having an EHR system]," she says. The people factor in all of this is really important, as those veterans whose pain is poorly managed may be at a greater risk for suicide. It's critical that doctors not only are prescribing an appropriate amount and avoiding dangerous combinations but also are continuing to take pain management into account. It's also important that once opioids and sedatives have already been prescribed that changes to the dose are done gradually and carefully. This is especially important if the patient has become accustomed to higher doses over a longer period of time. While Lin says that that OSI was an overarching initiative that highlighted the importance of opioid safety and provided tools (in the form of the dashboard), it does leave specific decisions about implementation to the hospital. Lin's colleague, Mark Ilgen, PhD, who is senior author on the study, adds that although guidelines should be implemented that will help reduce dangerous prescribing, they must be flexible enough to account for an individualized approach. "These results highlight the importance of addressing provider behaviors in our efforts to address the opioid epidemic and the need for large health systems to develop and implement systematic approaches that are flexible enough to allow clinicians to make individual decisions while still reducing the overall prevalence of potentially risky prescribing," says Ilgen, who is also an associate professor of psychiatry at the University of Michigan and a research investigator at the VA's Center for Clinical Management Research. Any time changes are being made, there is always some possibility of pushback. While the study did not look at specific patient responses to these changes, Lin says that paying close attention to individual needs is always important. This is one area where social workers can help. By stepping in and keeping a close eye on their individual clients, social workers can observe how patients may be handling changes to their dosing. In many cases, social workers are the ones on the front lines. Lin adds that although the study didn't examine pushback or challenges, that it is of course always a possibility. As OSI was implemented across the VA's network, there were likely challenges that needed to be handled. "It is possible that some hospitals had greater difficulty implementing changes compared to others," Lin adds. "I would very much emphasize the importance of gradual and individualized treatment at the patient level. In this study, we did not examine impacts on specific patients and their experiences, but I would say this is something important to examine as a next step." 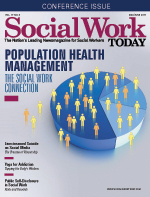 Looking ahead, Lin says that social workers can continue to play a role in positive change by maintaining their position in coordinated care efforts. "Social workers are a key part of the care team who often work with patients with complex medical, mental health, and psychosocial issues and often are crucial in coordinating care," she says. "It is very important for social workers to be aware of risks of high-dosage opioid use and concurrent use of benzodiazepines, as well as being aware of health system-level initiatives such as the OSI." Social workers may even be involved in helping patients adjust to changes in their dosing. Lin says she feels that social workers can be a connective piece of the puzzle that can help in the overall care process. "In my experience, social workers have been especially helpful in communication on both directions and care coordination," Lin says. And at the end of the day, even if social workers are not directly involved in making changes to the risky prescribing of opioids, their awareness of these efforts and how it may impact their clients is vital. Social workers can play an important role in supporting these efforts that will hopefully lead to life-saving changes. — Lindsey Getz is a Royersford, PA, and a frequent contributor to Social Work Today.